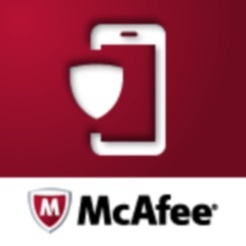 Keep your personal life personal with McAfee® Security for T-Mobile. o Shield your personal memory behind a secure PIN. o Take secure photos straight from the app with auto file encryption. o Backup your vault files with iCloud and remain encrypted. 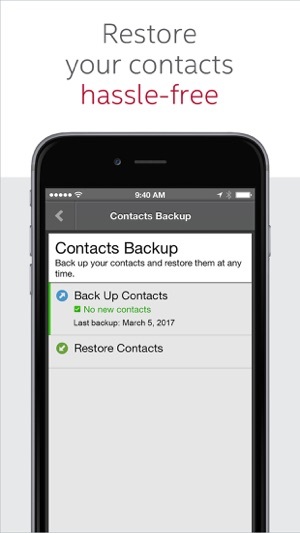 o Backup and restore your contacts. o Track your lost iPhone/iPad on a map. Enjoy peace of mind with McAfee® Security for T-Mobile, the most robust and comprehensive mobile security solutions in the market today! 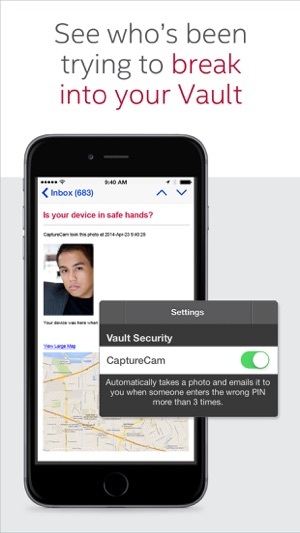 o Photo and Video Vault – Protect your photos & videos from prying eyes behind a secure PIN. 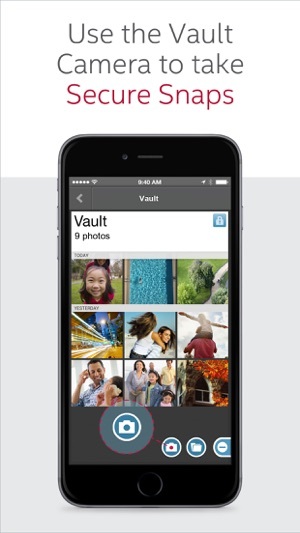 Vault files are safely encrypted and locally stored on your iPhone or iPad. o Secure Snap – Take secured photos/videos straight from the app and the entire photo session will be auto encrypted and locked in the vault. o Backup & Restore Contacts – Backup your contacts automatically and restore them hassle free. o CaptureCam – Takes a snapshot of an intruder on multiple wrong Vault PIN entries. Receive an email with the photo & device location. o Wipe Contacts – If you're sure your device has fallen into the wrong hands, remotely wipe your contacts before misuse. 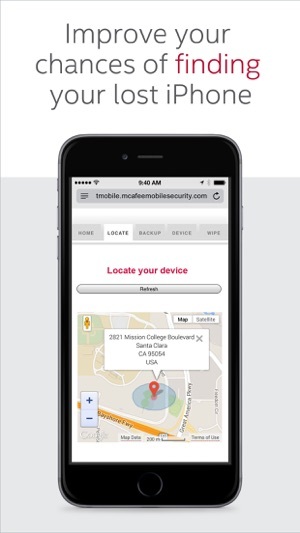 o Locate – Easily track your iPhone or iPad on a map at https://tmobile.mcafeemobilesecurity.com. o SOS – Improves chances of locating your lost device by saving your iPhone's or iPad’s location on low battery. o Remote Alarm – Activate it to locate your lost or stolen device, even in silent mode. Note: Continued use of GPS running in the background can decrease your battery life. Q&A: 1. Can I back up my Vault photos/videos to iCloud? 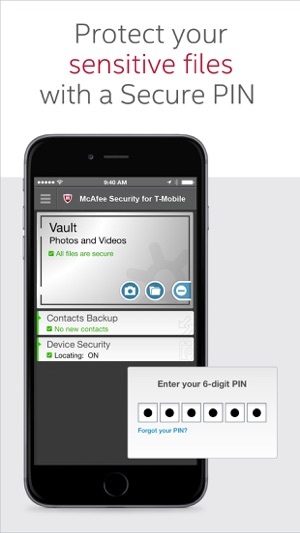 Yes, McAfee® Security for T-Mobile app will be backed up to iCloud along with Vault files. Your photos/videos will stay encrypted even if your iCloud account is compromised. 2. What happens to my Vault photos & videos if I lose my device? Vault files will be retrieved automatically to your new device as soon as you log in with your iCloud credentials and restore your McAfee® Security for T-Mobile app. So I got T-Mobile, downloaded this app, signed up and hooked everything up. The app is a bit outdated but still does its job. This app has some awesome features that you just don’t get from other companies. Say you lost your phone in your house, sign in on any other device and press the alarm button, your phone will automatically put the volume to 100% and start screaming so you can find it, which is EXTREMELY USEFUL. Also say you lost your phone or you think it’s been stolen, simply his login to the T-Mobile McAfee website and press locate, and it will tell you where your phone is in live time. It also backs up your contacts, vault, and some other things. Also, have some pictures you wanna keep away? Put it in your vault and put a pin on your vault. If someone tries to enter your vault, and puts in a pin incorrectly 3 times, it takes a front facing picture, and sends it to your email. It’s pretty amazing. You can do so many things from the website and it’s pretty amazing, don’t ever worry about losing your phone again. I have tried with this app on several occasions. Just don’t like that if I backup my pics I have to delete them or I keep getting a message that says my phone is not secure. I’m deleting the app again and not dealing with it. It’s a nice concept but the company needs to really work on it. Password with no special characters is a HUGE no no. It’s included with my protection plan but I won’t be using it. My cable company also offers it but it’s the same thing.